There are a plethora of legal circumstances and financial situations you need to consider while filing tax returns which makes it complicated without any professional help. If for instance you have adopted a child, got recently married or divorced or have people whom you are legally responsible for, it would have certain implications on your taxes. In such cases, hiring the services of a tax preparation firm can help you a great deal. If you have to do taxes on your own without any professional help, it may lead to mistakes. You might not be able to make smart tax-saving decisions. However, by hiring the services of tax preparation companies, you can rest assured that you have planned for your future years. The onus is that if your outsourcing firm helps you find even one significant deduction that you have missed, it would mean a significant saving which surpasses the average fee of the firm. You may argue that you would get the same benefit by purchasing an efficient Canadian-tax preparation software, it is not exactly the same. We agree that it would help you compute taxes, but it definitely can’t represent and answer queries on the deductions that have been made on your taxes. Having a tax preparation service means you have someone you can count on and help you authenticate the system and help you with the entire process. What software can do in tax savings is only limited to your knowledge and expertise in it. However, any company into professional tax preparation in Toronto would be able to tell you that it benefits you more to have an actual person do your taxes. Your tax preparer can recommend numerous ways to save taxes and resolve all your queries related to tax-savings. Often in tax savings, what is applicable for someone might not be the same for someone else. It is thus difficult for a layperson to understand and frame the best approach to tax saving without any expert help. 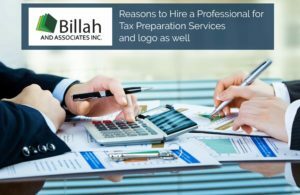 Getting the assistance of a firm into professional tax preparation in Mississauga with the required expertise would help you get the best tax-saving recommendations for you. There is no right time to hire professional help to do your taxes, and it is definitely more beneficial and cost-effective than to do it manually and end up with some irreversible errors which might lead to fines or extra expenses. Previous Post What Comprises of Financial Statement Audit Report?